In his speech addressed at the party, President Lin expressed his best wishes to all students and foreign experts. 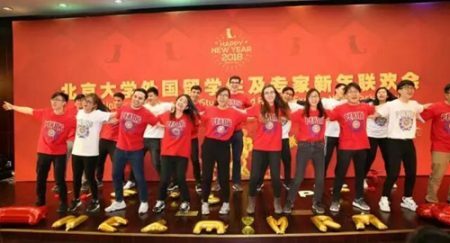 According to Lin, there were more than 800 foreign experts and over 6000 international students in PKU up until 2017. Also, they all had their unique impressions of the campus. President Lin also pointed out that the coming year of 2018 would be significant for PKU and even for the whole China since it marked the 40th anniversary of the reform and opening-up policy as well as the 120th anniversary of PKU’s founding. “Peking University would strive to create more opportunities for everyone, and we hope that students could achieve health, happiness, and success in the upcoming New Year.” President Lin said. 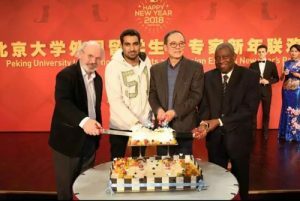 At the party, President Lin cut a cake with Tom Manson, a foreign expert from Canada, Mr. Carrington Ca’, who once graduated from PKU, and Yousaf Muhammad, a Pakistani student as representative of international students. 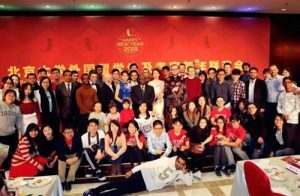 After the reminiscence of the wonderful campus life in 2017 through a video, international students performed a song & dance show—“Happy New Year”. 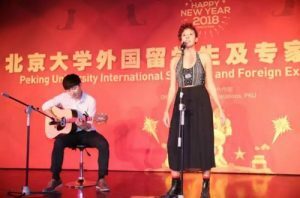 A French girl named Forman, Ines Sophie Caroline impressed the audience with her mellow voice in the song “Sunny”, which was accompanied by the guitar played by Li Qijun, a student from South Korea. The performance of the song "Sunny"
Students from other countries also gave a series of excellent and various performances, which were greeted by cheers and applauds from the joyful audience. 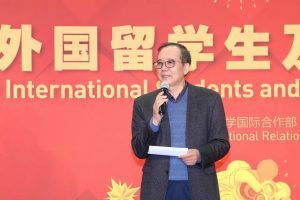 At the New Year’s party, distinguished guests were also invited to present certificates and prizes to winners in the 14th International Cultural Festival. Groups from South Korea, Malaysia, Japan, Russia and North Korea reaped the title of “Best Stage Performance”, and the awards for “Best food” goes to the groups from South Korea, Japan, Turkey, Malaysia and Singapore. All participants at the party.